Home » Personal Finance » You want 100$ today or 200$ after month? If someone ask you that you want 100$ today or 200$ after month. 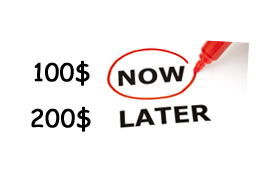 You will defiantly reply 100$ today, very few select 200$ after month. Well it is not question of 100$ or 200$ when it comes to money 99% people believes in immediate pay off rather than waiting for larger gain at later stage. They are ready to sacrifice long term gain over short term gain. This is called as instant gratification. Buy something fancy and expensive now than something which you can afford. “Life is short, we work hard and we should enjoy the ‘small things’ now rather than waiting.” But what about additional expenditure or growing debt No one bother about it. Our mind is driving force behind this. Daniel Kahneman renowned psychologist and winner of the Nobel Prize in Economics mentioned in book “Thinking, Fast and Slow” Two systems that drive the way we think. System 1 is Fast, Intuitive, and Emotional. System 2 is Slower, more deliberative, and more logical. If we study this system we can easily answer that how this two system shape our judgment and decisions. Starting from the impact of overconfidence on corporate strategies, the difficulties of predicting what will make us happy in the future, the profound effect of cognitive biases on everything from playing the stock market to planning our next vacation. Remember you can’t obtain long lasting happiness through instant gratification. It’s short-lived! Control your mind and strive of delay gratification! « Can one Whatsapp Message make India rich?